Can some one school me on SR brand bicycles please. No authority here but I've got one and I use to have a catalogue that got lost on an old hard drive crash. SR has nothing to do with Sakae Ringo or SR Suntour or SR components. Years ago I read in my catalogue that they were quality Japanese frames imported to NA and specced out with nice kit. Their build quality and details always remind me of Centurion/Fuji/Nishiki. They were selling most of these bikes though the mid to late 80's. Yes, SR made some pretty nice bikes. I still kick myself for not getting nice 'touring' SR semi-pro when I had a chance. Loved the color scheme on it, and triple, and barcons. Other side of SR bikes, since nobody knows this brand, their resale value tends to be on the low side, unless you find a very educated buyer. Thank you Oh Great And Knowledgeable Search Master, but it's not very easy to search just two letters. Nor does that have anything to do with the history and background of the brand which is what I wanted to know. Not what some guy's in San Diego's was worth back in 2009.
sigh. so, there's 2 things you can't do. search or read. There's not that much info on SR bikes, but here's other stuff I've found (just in case someone else stumbles upon this thread). SR Bicycles, 2765 Main Street, Chula Vista CA 92011. Edit: I called Kirk's bikes (original seller) and his shop is still open! After congratulating him on this accomplishment, he told me the SR bikes were sold/made by a Mexican family that also ran the Windsor factory in Mexico. The frames (and probably all parts) were imported from Japan. They probably ended up making some "SR" decals and slapped them on the bikes. 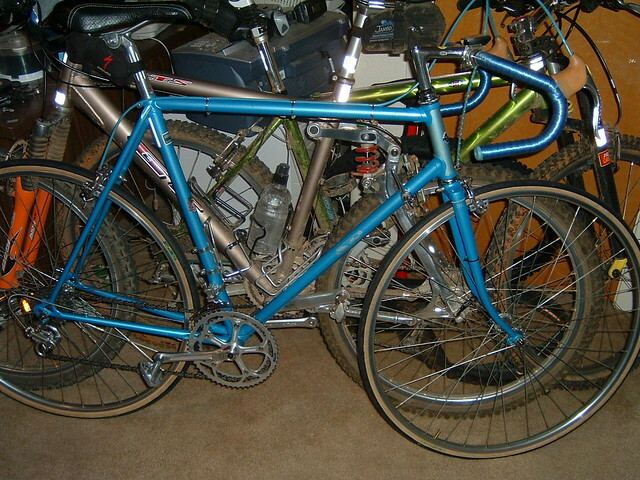 Kirk commented how these bikes were an incredible value at the time. Edit #2 from Kirk: "That is what we called the "Pro", not just the "Semi-Pro" which was a more more popular model to to low price ($299 if I remember correctly). I can't remember for sure what the Pro went for, but I'm pretty sure it was still under $500, a real value considering the performance capability." SR Sakae Prism 94-95 Aluminu. There are many threads here on BF that discuss SR bikes. I have a 1983 SR Semi Pro and it's a sweet bike. Well then, I stand corrected. I tried the same BF search ... I agree, what a pain. Perhaps if Illwafer had just posted his original link without editorial comments it would have been more helpful from the start. What brand of down tube shifters does it have, and do you know if they original? I've picked up SR Semi Pro frame and fork, but it doesn't have the shifters with it. Mine is set up for brazed on ones. I haven't finished bringing the frame up to where I wan't it yet. Would like to put on the same parts it originally came with if thats possible. Thanks. semi-pro probably had shimano 600 arabesque. the rest of your parts should give you some hints. My SR Semi-Pro, and every one I've seen, has the complete 600 gruppo from 1979. The crankarm is a swaged version, but most 600 arms are one-piece. Perhaps a cost-saving version or might have to do with the exact year of production. I think it was a cheapening myself. Arabesque 600 calipers feel quite flexy! Stock narrow Araya rims are 27". I added genuine hoods. I never heard of the Mexican link, and would have assumed the bike was brazed, painted and assembled in the land of the rising sun! The handling is excellent, and the ride is just good, so assuming these frames are on the stiff side with relatively thick tubing vs. a pro bike. This shade of metallic blue looks crazy good out in the sunlight. Many compliments on this modest ride! Most of these models turn up in blue, in 57cm size, at least around here. Red is also common. Mine weighs 24 lbs as shown with pedals (but without seat bag). Bike was sourced from Goodwill for I think $40 in 2006. Last edited by dddd; 03-17-12 at 05:34 PM.